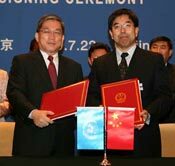 In 2009, the Chinese Government set up a trust fund project at the United Nations, aimed at strengthening the statistical capacity in China and other developing countries in Asia, especially in the area of basic statistics. This 5-year project (from 2009 to 2013) is expected to help China and other developing countries in Asia to develop a better understanding of international practices in a wide range of subject matter areas, including statistical classifications, service statistics, use of administrative data, energy and environment statistics and their relation to the system of environmental-economic accounting, national accounts, population statistics, and price statistics. In addition, the project will enhance further the knowledge transfer and the knowledge sharing among developing countries through South-South collaboration. The project's expected accomplishments include (1) enhanced organization of National Statistical Systems and improved dissemination of data to policy makers and other users, and (2) increased capacity of the National Statistical Systems to produce better quality and more relevant data for policy makers and other users, especially in the areas of economic and environment statistics. In 2011, the National Bureau of Statistics of China, in collaboration with the United Nations Statistics Division (UNSD) and other UN statistical entities, established a new statistical training institution: China International Statistical Training Centre in collaboration with UN Statistics. The Centre aims to strengthen the statistical capacity globally, and especially among the developing countries, through the provision of training in official statistics, the promotion of rational and effective statistical practices, and regular exchange among international statistical offices, academic societies and other groups in the world.